Champions of the last two years, Kilmoyley were defeated as Ballyduff came back from a six points half time deficit to qualify for the Final where they will meet Lixnaw who accounted for St Brendans in the other Semi Final. 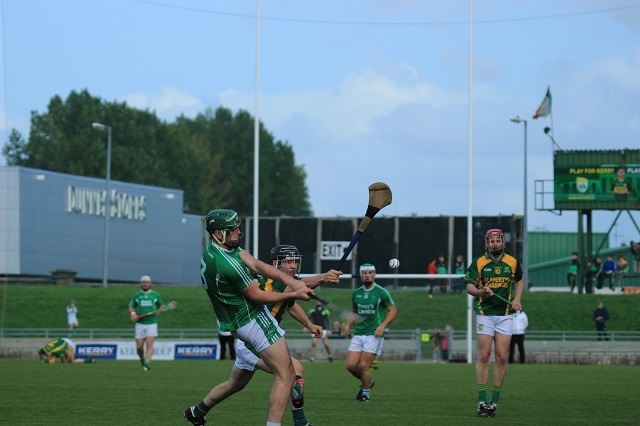 A second half metamorphous of the sporting kind turned a lame Kerry SHC semi-final at the Austin Stack Park Tralee between three in a row seeking Kilmoyley and a written off Ballyduff side into a thunderous second half that saw Ballyduff produce an incredible comeback. The first half was a sleep fest as Daniel Collins with nine points, all but two from placed balls and a point from Sean Maunsell had Kilmoyley in cruise mode as they led 0-10 to 0-4 at the interval with Podge Boyle with two frees, and one each from Jack O’Sullivan and Daniel O’Carroll barely keeping Ballyduff in the game. But not alone did Ballyduff stop conceding frees but their intensity levels increased – why did Liam Ross think a team could change from one half to the other “ I think we were standing off Kilmoyley in the opening half and giving their players too much respect. We knew we had the players who could drive it on and get stuck in and win most of the physical battles. So we knew by upping our intensity that we would be right in there with a shout. It was I would think even for neutrals the best second half of hurling in the county for years. The Duffers outscored Kilmoyley 1-13 to 0-6 in the second half was Podge Boyle, Mikey Boyle, Jack Goulding, Paud Costello and Jack O’Sullivan transformed the contest and Kilmoyley were helpless to stop the onslaught. Subs: G O’Brien for a Boyle (h/t), P O’Carroll for J Hussey (h/t), L Boyle for D O’Carroll (60). KILMOYLEY: A McCabe; S Nolan, C Savage, F McCarthy; D Fitzell, T Murnane, K McCarthy; P O’Connor, J Godley; S Maunsell, D Collins, P Maunsell; M O’Connor, A Royle, M O’Connor. Lixnaw advanced to meet neighbours Ballyduff after this high intensity SHC semi-final played at the Austin Stack Park on Sunday afternoon but it took a combination of some excellent scores from the Conway brothers and two sending’s off to see them over the winning line. St Brendan’s looked the better side for much of the opening half following a 4th minute goal from Cian Hussey and points from John Egan (2), Hussey, Tom Moloney, Brendan O’Connor and David Griffin as they led 1-6 to 0-5 at the interval. Shane Conway contributed 0-4 but saw his penalty attempt brilliantly saved by Darren Delaney while wing back Brendan Brosnan scored a beauty from play. Two early Shane Conway points, one a free and the other a thing of beauty after a build up involving his brother Mike and Rickie Heffernan. But St Brendan’s hit back 38th minute after a defensive slip saw John Egan get in behind the Lixnaw defense and buried it to far corner of the net and it appeared to have given St Brendan’s the edge as they led 2-6 to 0-7 but when Kerry defender Rory Horgan got a red card a minute later after the umpires spotted an off the ball incident with Ricky Heffernan, St Brendan’s world fell apart and Lixnaw took over. The Conway brother’s Shane and Michael closed the gap and then in the 49th minute John Buckley’s long delivery was flicked to the net by Brian McAuliffe and Lixnaw were a point in front. Mike Conway from a Jeremy McKenna assist fired one over with his back to goal and then disaster for St Brendan’s that damaged them below the waterline. Kevin Orpen picked up a second yellow for St Brendan’s it was game over as John Griffin and Brendan Brosnan shone in the closing minutes. Despite frees from John Egan and a Kevin Skinner point, Brendan Brosnan and Mike Conway responded for Lixnaw and despite late pressure the extra men, meant Lixnaw were able to drop players back and the goal St Brendan’s needed never came. Lixnaw: M Stackpoole; D McCarthy, P Corridan, G Stackpoole; B Brosnan, S Power, C O Keeffe; J Griffin, B McAuliffe; J Buckley, R Heffernan, R Galvin; J Wallace M Conway.